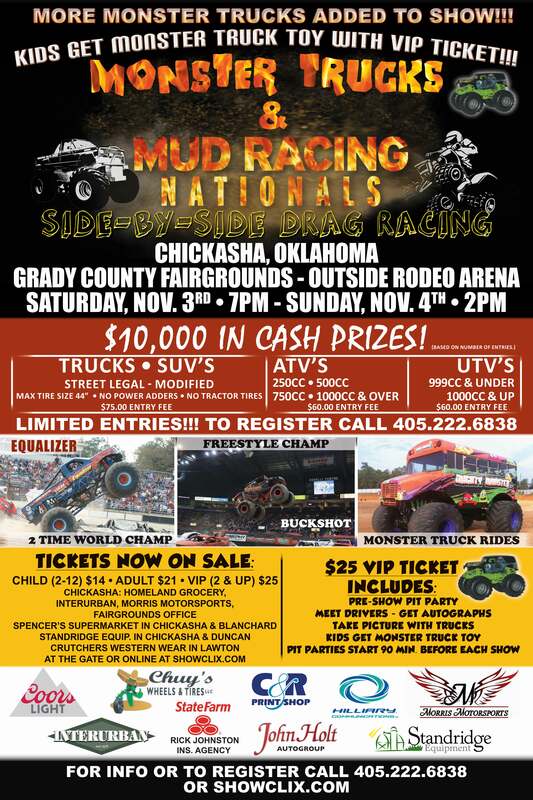 MONSTER TRUCKS AND MUD RACING NATIONALS. SIDE BY SIDE DRAG RACING IN THE MUD FOR TRUCKS, ATV'S AND UTV'S. TO ENTER CALL 405- 222-6838. VIP TICKETS: $25 ages 2 AND UP! ADMISSION TO THE PRE SHOW PIT PARTY: TAKE PICTURES WITH TRUCKS, GET AUTOGRAPHS, KIDS GET TOY MONSTER TRUCK!